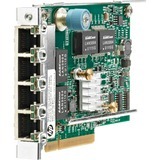 Add four Gigabit Ethernet ports to a client, server or workstation through one PCI Express slot. 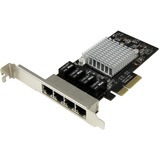 Now you can add four separate Gigabit network ports to your client, server or workstation through just one PCI Express slot, to provide connectivity to multiple networks without draining your budget. 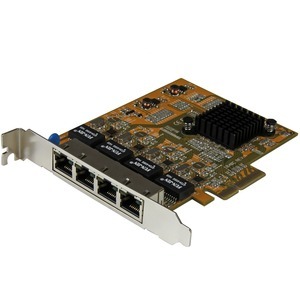 This 4-port network card delivers powerful connectivity for your business, corporate or government office environment, with support for high-performance, 4-channel networking and a maximum throughput of up to 1000Mbps in each direction (2000 Mbps total). 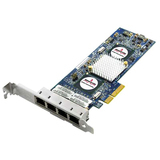 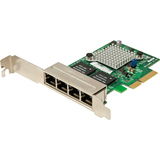 The network adapter card features the Realtek RTL8111G chipset, which is designed to deliver the performance and enhanced capabilities you need for reliable network connections to your server or computer. 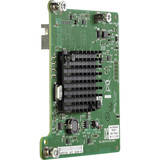 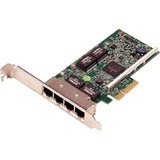 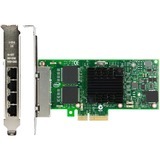 This versatile quad-port network card is ideal for many business applications requiring upgrades to servers or workstations, adding feature-rich Gigabit networking with four independent ports. 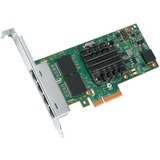 Compatible with a broad range of operating systems, this cost-effective PCIe Gigabit NIC is suitable for many SMB and Enterprise applications such as virtualized environments that require multiple NICs (check your VM software for chipset compatibility). 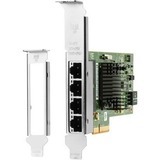 The ST1000SPEX43 is backed by a StarTech.com 2-year hardware warranty and free lifetime technical support.